When I grew up in Leicester in the 1950s, one of the shops I most enjoyed being taken to was The Beehive, a draper's in Silver Street. The fascination lay not in the fine linen or fashionable millinery. It was the overhead equipment which the sales assistants used to whisk away my mother's payment to the cashier, who sat aloft ensconced in her office in the middle of the shop. The cashier would then return the receipt with any change, for the assistant to hand back to my mother. As I remeber it, the other half of the shop had a Rapid Wire system, where a 'car' was propelled along a wire by a catapult arrangement. This was more dramatic. The assistant pulled the handle and sent the car whizzing along the wire to stop sharply with a crashing sound at the cashier's terminal. The Cash Ball was a more sedate device - though it was of more elaborate construction and I have since learned what a rarity it was in the 1950s. The Rapid Wire system could still be seen in several shops (Smith's clothiers on the High Street? The Co-op?). 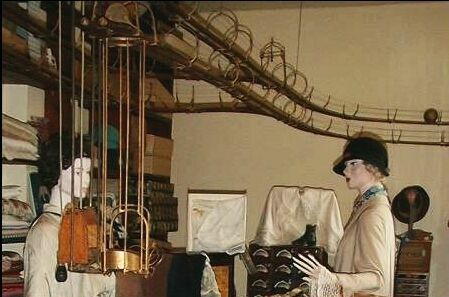 A third type of cash carrier, the Pneumatic Tube, was popular in shoe shops. Cable systems (where the car was attached to a continuously-running cable) were very rare in the UK and I only discovered them when I started researching cash carriers. The Beehive alas disappeared in 1962. The Leicester Mercury of 13 October described it as "that Silver Street emporium which gloried in its old-fashioned look coupled with old-fashioned ways". But some of its fittings reappeared in the former Museum of Costume in Wygston's House in Leicester, including a part of the Cash Ball system. A number of other examples (mostly Lamson's Rapid Wire or the Gipe system) are also displayed in museums. I have often overheard comments from visitors saying "I remember those in so-and-so's shop". By searching on the Internet I have found that some wire systems are still in use in various parts of the world. There seems to be very little printed material about these cash carriers so I have set up this website with the information, pictures and references that I have. I would be very glad to receive any other material including shops where they were installed and any anecdotes or reminiscences. Please e-mail to andrew@cashrailway.co.uk. The site covers all four types of carriers - Cash Ball, cable, wire-line and pneumatic systems.